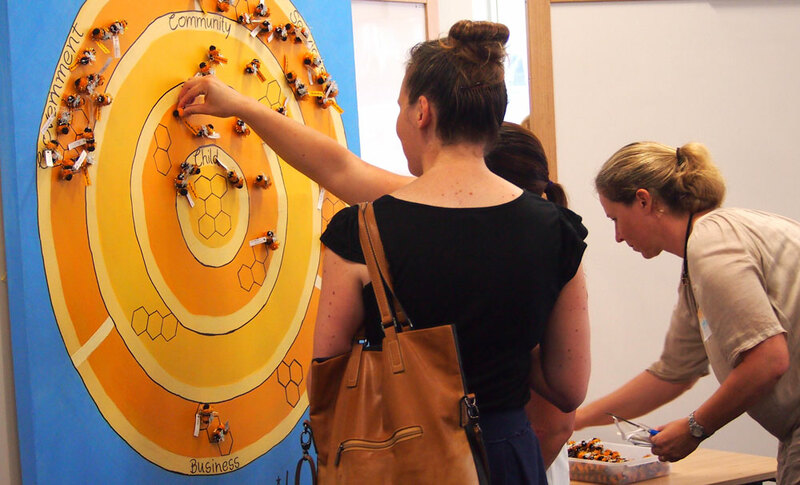 The Impact Assembly helped a collective impact effort dubbed "The Hive" in Sydney's outer west to concentrate their effort. 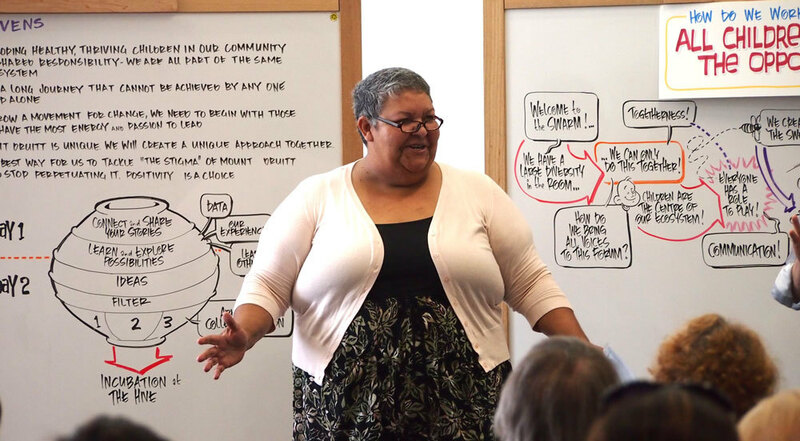 Collaboration between community, not-for-profits, business, government and philanthropy is the only way we'll solve our biggest problems, the chief of a social enterprise dedicated to joint effort says. The Impact Assembly's founder and director, Liz Cameron-Smith, is passionate about the enterprise's mission, a child of the second biggest professional services firm in the world, PwC, late last year after several years of testing. And the brainchild of an organisation with a pedigree of cracking problems for government and big business is now turning its attention to the toughest issues facing society, such as homelessness, suicide, chronic health issues, youth unemployment, educational disadvantage, and Indigenous inequality. The enterprise employs a PwC method dubbed "The Difference", honed by techniques mastered by commercial consultants for use in high-powered boardrooms. But instead of just corporate bigwigs, Ms Cameron-Smith and her team bring together groups that include not-for-profit leaders, philanthropists, workers, clients and people "at the heart of the issue" to "connect the dots" in a neutral setting to "create solutions". "This really has the chance to drive completely new ways of working, because you're combining the strengths from different sectors to come up with much more innovative ways of thinking about tackling a problem." Bringing people together from diverse viewpoints and agendas is part of PwC's process. She says the ambitious agenda is a deliberate strategy, because many entrenched social issues aren't going to be solved by "isolated action". "My question is: How else are you going to get change to happen?" And she is firmly of the view that it is collaboration that will generate systemic change. One major project has brought together mental health organisations across the country to tackle suicide. Ms Cameron-Smith says several CEOs were already meeting in cafes in a bid to "align their efforts" when one of the organisations was referred to the relatively new service. Already the project has expanded to include more organisations, which have agreed to an agenda that involves regular meetings, creating a "collaborative culture", and setting some "high impact initiatives" in train to trial their work. The Impact Assembly is also working with a group trying to forge a national approach to tackling of obesity, but it's doing more than facilitating the group. She says as well as working with The Impact Assembly, PwC has deployed consultant to analyse the obesity issue, including how much failing to act will cost us all. "We know that the skill set we have around design and facilitation is one part of the way you can enable collective effort, but often they'll need other skill sets as well, whether they are legal, economics, communications, IT." She says The Impact Assembly actively seeks out about half its clients in a bid to find the "messy" social issues, rather than wait for them to arrive on their doorstep, and the other half approach PwC directly for help. A critical part of making these collaborations work is using different styles of joint effort between sectors, such as not-for-profits and business. "We want to move beyond traditional models of corporate social responsibility, such as the 'one day of volunteering a year', and instead look at how we pool volunteering and package it up around particular projects that feed into more systemic change." She believes the old methods of a day of volunteering by big companies "are numbered", largely because organisations realise "they're not creating a lot of impact". "Most of them want to engage in a more meaningful way … and on the flipside, big not-for-profit organisations have had enough of that sort of model, because it's often more of a burden than an asset." Instead, she says, a more effective joint effort sees groups deploy the "strengths and assets of the corporate sector to support social change". She believes business and not-for-profits don't have a choice but to cooperate on the big issues. Not-for-profits need help to achieve their missions, while the corporate world will continue to lose the public's trust unless they've got an authentic commitment to good. And that cross-pollination must spread further to have the biggest effect, she says. "The majority of the groups we work with are working across community, business, government, not-for-profit and philanthropy. The Hive has demonstrated the success of the Collective Impact approach to social intervention. She gives as a theoretical example a not-for-profit seeking a corporate partnership to tackle homelessness. "If that corporate was to send a few people to volunteer in a soup kitchen, that's only going to have so much impact. But instead imagine it's a bank. Think about the data that a bank has access to, and the way they can predict when someone might be at risk of falling into a housing crisis. "Imagine how powerful that data set could be to enable a not-for-profit to figure out at what point to provide support to people who are at risk." She says a solution might mean pressing the bank to shift its policy away from "pushing someone over the brink and into … homelessness" and towards offering products that could help those at risk. "We have to find ways of business to contribute in a more meaningful way," Ms Cameron-Smith says. These kinds of models require organisations to adopt methods such as a "systems thinking mindset" and models such as "Collective Impact", which was developed in the United States and has had some take-up in Australia. 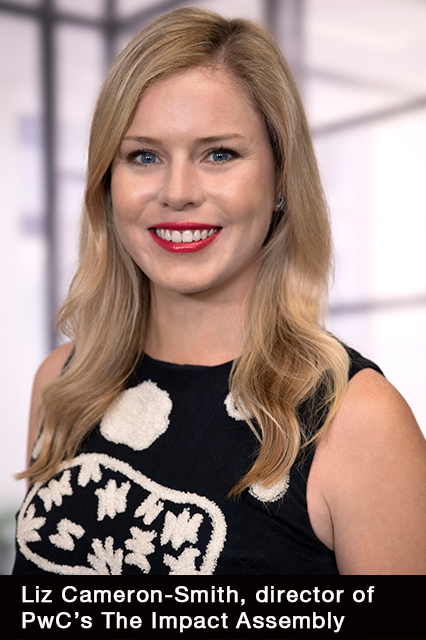 Ms Cameron-Smith says PwC helped with one project known as The Hive, a collective impact effort by United Way, the NSW Government and the Ten20 Foundation, in Mt Druitt, in Sydney's outer west. PwC's role was to host a two-day event "that helped them build the case for change", partly by finding common ground among a large number of people with "diverse views and different agendas". PwC continued to work with the group for another 18 months to refine their vision and strategies. 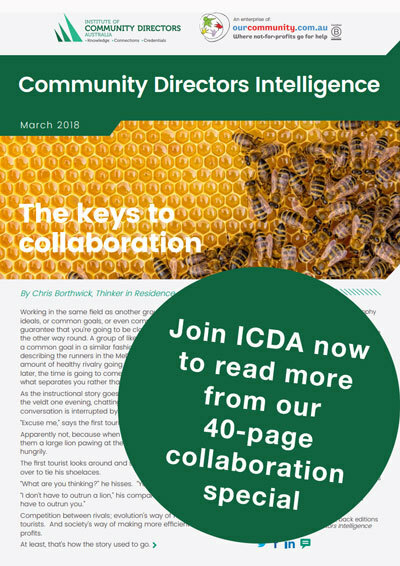 "We know that collaboration is hard, and to make it work effectively, it is important to have that collaborative infrastructure, because usually it's not anyone's day job." "We make it our job to think about how you engage people, how you navigate those complex dynamics and move from talk to action."